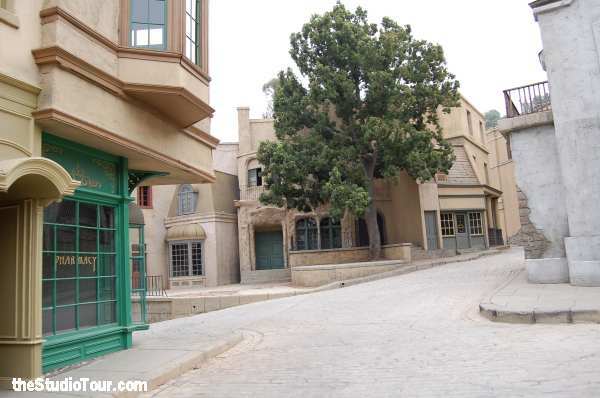 One of the perks of working as a tour guide at Universal Studios was being able to tool around the backlot, getting up close and personal with the facades, mostly mere painted pieces of plywood, nothing more than shells supported from behind by some 2 by 4’s. Sometimes the buildings were decorated with slabs of foam molded in the shape of bricks. On camera it works. Up close, the faux brick is slightly spongy to the touch. Just a bit of fakery. While New York Street probably got the most use as a filming location, it was Little Europe that fired my imagination. Walking along the cobblestone road, passing the charming shopfronts, it’s easy to imagine French cafes and patisseries come to life. The last time I saw Paris—and the Universal backlot—was in the mid to late eighties. These days I can conjure the same feeling of being transported to another time and place on my daily walks around my own neighborhood. 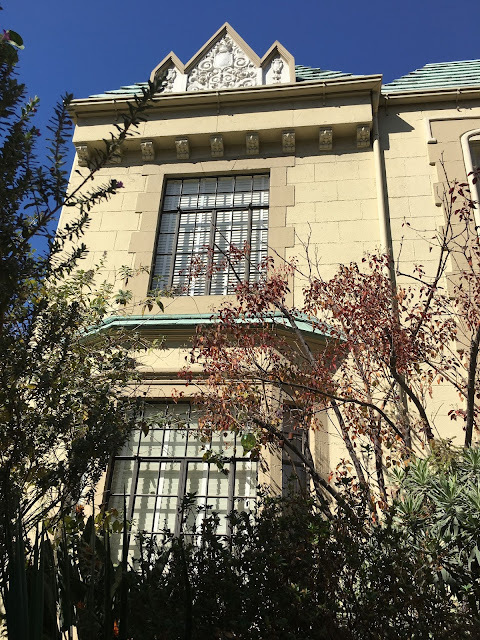 Built in 1931 in this ‘Chateauesque’ style building—a French apellation to be sure—is designated Los Angeles Historic-Cultural Monument #423. Sans the car, this could be any old rue in Paris, yes? Striking a slightly more ominous note, Historic-Cultural Monument #473 was erected the following year, just a block away. It’s almost identical, except for the color of the roof and some of the trim. The black and green fabric appears to be some sort of tenting for the rooftop deck but like the myriad owls—there are more on the other side of the building—they don’t create the most attractive appearance. Despite that, I’m a fan of both buildings. 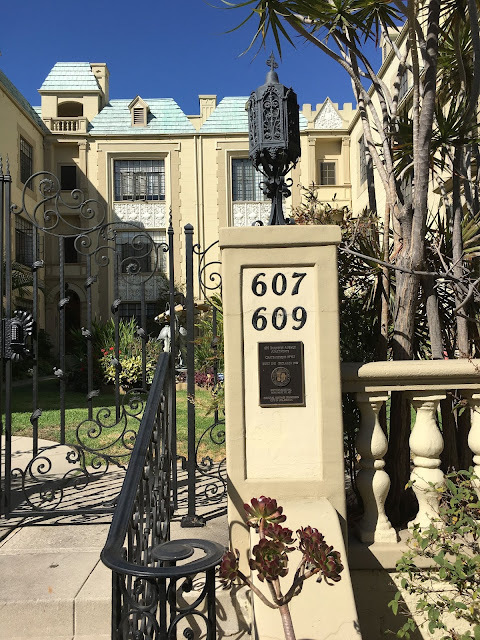 While the last twenty years has seen a rise in the construction of neo-Mediterranean homes, hybrids that are part-Italian, part-Spanish, part-Greek, this pretense to something foreign and exotic is clearly not a new development in the world of architecture. 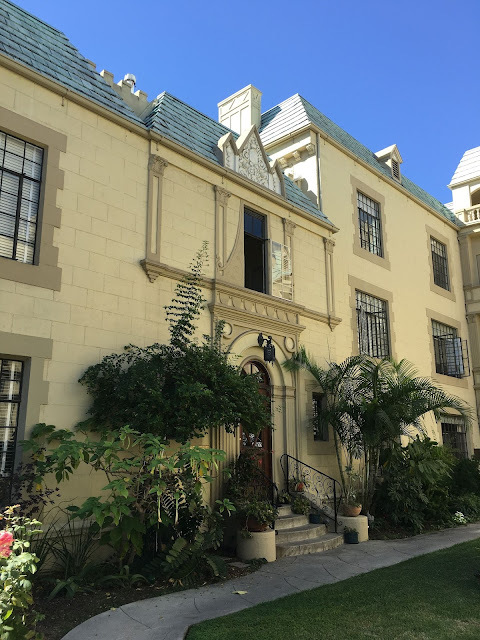 I’m not sure if America’s fascination with the architecture of other places is more pronounced here in LA where it’s de rigueur for Tudor style homes to live alongside Tuscan villas or if it’s just because I live here and I’m out walking every day that I notice it. 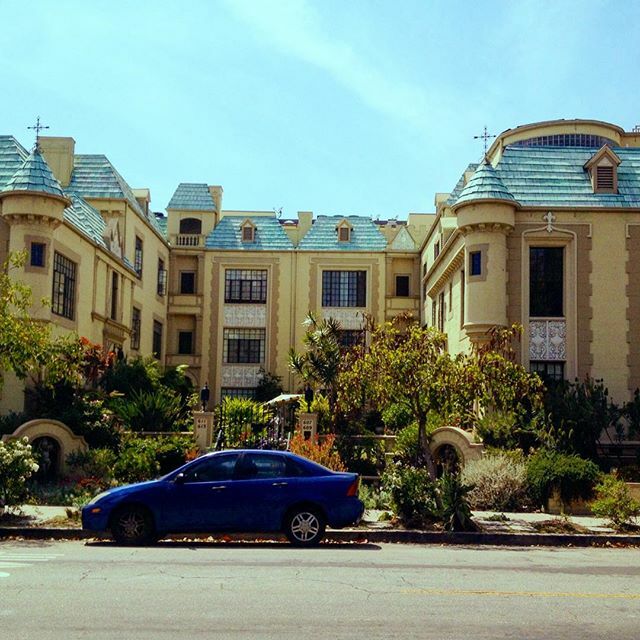 To be honest, while I’m disdainful of the new monstrosities, I’ll forgive any building that predates my own lifetime. Dreaming of France? Sometimes, it’s right around the corner. I’m making my daily 10,000 steps more interesting by snapping pictures with my iPhone of the beautiful buildings and just plain interesting things I see, and posting them to my Instagram. What gets you lacing up your walking/running shoes? 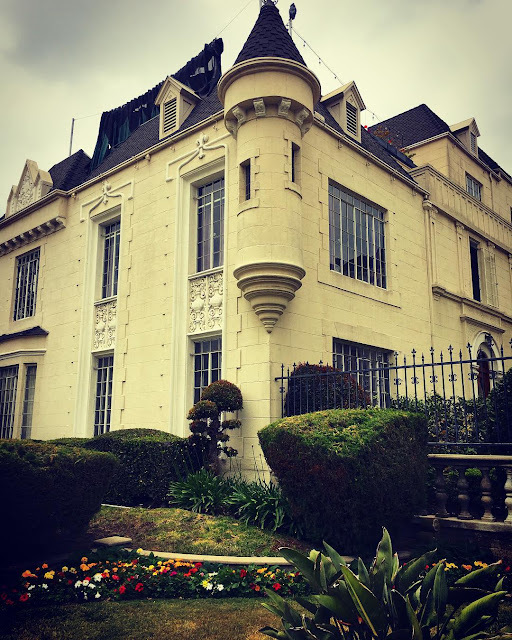 Visit An Accidental Blog for more Dreaming of France posts. Thanks for playing along, Sim. I think older neighborhoods are more likely to have European looking buildings, while new builds put up cookie cutter houses. Of course, some of the nouveau riche are building French chateaux of their own. Can't wait to have a French house of my own and to be posting pictures from France everyday!!! I can't wait for that for you either! Bonjour Linda! Merci. It's lovely to meet you too.